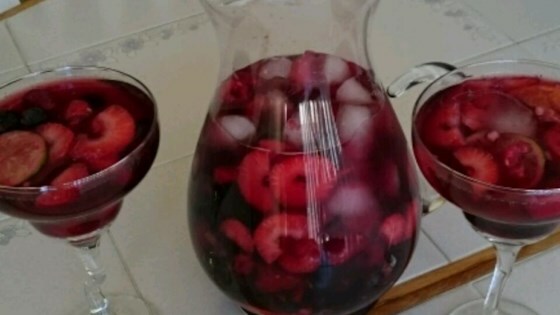 "Sangria is a Spanish wine punch that includes chopped fruit and sparkling water for a refreshing summertime cooler." Dissolve sugar in tap water in a large pitcher. Add orange slices, lime slices, and wine. Stir in ice cubes until cold. Top with sparkling water. Serve in red-wine glasses, with fresh berries in each glass. As the recipe is written, not enough fruit for 5 bottles of wine. And 6 fl. oz. of sparkling water in FIVE bottles of wine, Why bother? The proportions are way off. Find a better recipe. Ziyafet, you can use red grape juice in place of the red wine...haven't made this myself but it sounds amazing and I'm excited to try it! Thank you for sharing! I used two bottles of wine. It was delicious!